Why Left Turns Cause Motorcycle Accidents | DeLoach, Hofstra & Cavonis, P.A. Motorcyclists are required to take safety courses and ride responsibly and even defensibly, taking on the lion’s share of the burden in avoiding a crash. They're advised to wear bright clothing, use their headlights, and even wear helmets and safety gear to protect themselves from other road users. Unfortunately, riders are also more likely to suffer physically and financially than drivers after a crash—and they may also have great difficulty getting an at-fault driver to pay for the costs of an accident. Experienced bikers know the majority of motorcycle accidents are caused by drivers. The most common excuse drivers give after a collision is that they simply “didn’t see” the biker, even in cases where the biker was doing everything possible to be seen. A driver’s failure to notice a motorcycle rider is particularly dangerous when the car is turning left in front of the motorcycle, since these collisions cause severe injuries to bikers who actually had the right of way. Left-turn accidents can also cause bikers to be injured even when the driver doesn't make contact with the biker. A driver cutting in front of a motorcyclist can force the biker to make an evasive maneuver to avoid a collision. As a result, the biker may skid out of control, go down an embankment, or suffer injuries as he lays the bike down. 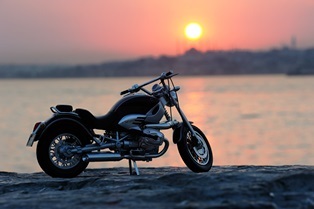 To add insult to injury, many such incidents are reported to an insurance carrier as “single vehicle accidents,” implying the biker is the person at fault for the injury. Drivers and motorcyclists share responsibility for avoiding accidents, and both are responsible for covering the costs of an accident with insurance coverage. So how can you tell who should pay for what after a crash results in significant injury costs? Fault. Fault is a major determining factor in injury cases, and typically hinges on the question of negligence. For example, if a driver didn't have the right of way, or didn't signal the turn before crossing the intersection, his actions could be construed as negligent. Drivers may also be at fault if they admit to “not seeing” motorcycles or misjudging the speed or distance of the motorcycle. Even if a biker shares some degree of fault, he or she can still get compensation for injuries. Extent of injuries. Juries must take into account the extent of the injuries that both parties have suffered. Bikers aren't nearly as protected in a crash as drivers and passengers of cars, and can incur significant medical expenses as a result. Motorcyclists typically endure broken bones, facial injuries, torn ligaments, nerve damage, and other conditions that require ongoing treatment. Permanent losses. The court will typically award a victim higher damages if his or her ability to earn a living has been affected by the crash. A rider who suffered a permanent disability, such as amputation or traumatic brain injury, which might greatly impact future income may be granted an additional sum in compensation. Pain and suffering. Motorcyclists may be owed damages to compensate them for the unnecessary suffering the accident has caused. Amounts for pain and suffering can be awarded if the driver was extremely negligent—such as driving while drunk or distracted—or the biker suffered permanent scarring or disfigurement. If you were hit by a left-turning car, the next step to take is to seek the advice of an experienced attorney. Our firm has helped many bikers get the justice and compensation they deserved after crashes caused by improper left turns—and since we work on a contingency-fee basis, we do not collect any fees until your case is won. Simply fill out the quick contact form on this page to set up your consultation with an injury attorney.